The Biodome- Combining aquaculture and gardening is so smart! Home / Aquaculture / The Biodome- Combining aquaculture and gardening is so smart! 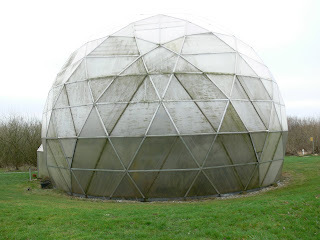 The Biodome is a large dome located here at the Folkecenter that combines a hydroponic greenhouse with an aquaculture system. It utilizes an integrated approach to water and nutrient reuse, heating resulting in organic fish and plant food production. Inside, enough food to feed seven families can easily be produced. The geodesic 5/8th dome construction has a high volume-to-surface area which minimizes construction materials and is structurally very strong and therefore less susceptible to wind damage than a conventional rectangular shape. The spherical shape also maximizes the solar gain no mater where the sun is in the sky and minimizes heat losses throughout the year. What results is a Mediterranean-like climate created here in Denmark where a large variety of plants that can be grown over an extended growing season: grapes, figs, papaya, numerous varieties of tomatoes, chilli peppers, herbs and so much more. There are three levels in the dome, the ground floor has 15 sqm of plant beds and two 23 sqm ponds (in above ground swimming pools). The first floor contains 44 sqm of plant beds and the 2nd floor contains 45 sqm of plant beds. The two ponds currently contain some estimated 400 fish: grass carp, common carp, gold fish, silver carp, rudds, and koi carp. On the surface of the pond numerous floating and rooted water plants grow: duck weed, water lettuce, water hyacinth, water cress and water parsnip among others. These plants naturally reproduce and live off of the nutrients in the water, sunlight, and CO2 provided by the fish. In return they oxygenate the water and serve as food for the fish. In fact, no additional external feed is required. On this vegetarian diet the fish grow by about 300 grams for every 3 kg of plant matter consumed after 10 months. The fish and the greenhouse plants also form a symbiotic relationship. First off, the fish provide CO2 into the air, which is important in the photosynthesis process. The water from the bottom of the ponds, which contains fish excrement and high levels of nitrates and ammonia, is pumped up to levels 1 and 2 and into the growing beds. This natural fertilizer provides rich nutrients for the plants. The plant roots strip the nutrients from the water as it trickles through the soil and back down to the ponds, arriving clean and full of oxygen for the fish. The Biodome is very inexpensive to operate and easy to maintain. The only inputs into the system are the sun, some water and a small amount of power, which is required to run a few timer-activated pumps. The sun naturally provides light and heat and no additional heating infrastructure is used. Here at the Folkecenter the required power is provided by the wind. Rain water is collected in a trough surrounding the dome and is pumped into the fish tanks as required. This makes the dome very energy and water efficient. Other important advantages of incorporating aquaculture within a greenhouse are: (i) the body of water acts as thermal storage and helps to regulate the internal temperature by dampening temperature swings, both high and low, (ii) the ponds provide evaporative cooling in the summer, and (iii) the resulting supply water for irrigation is warm. Hydroponic greenhouses are commonly used to produce many of the fruits and vegetables found in our supermarkets due to the high yield and short growing time. The addition of a nutrient-rich solution (typically based on hydrocarbons) and sometimes industrial CO2 is required. Additionally without thermal storage (in the potential form of aquaculture tanks) the greenhouse can not take advantage of passive solar heat gains and therefore require additional fossil fuel inputs. Aquaculture without plant production equally has its drawbacks. Without the use of plants the fish farm operator has to provide mechanical filtration methods to filter debris, remove nitrates and ammonia, and oxygenate the water- all of which require energy. In addition, fish feed is often unsustainable as it is harvested and extracted from far-away ecosystems (ie. sardines from South America dried and shipped to Canada). This causes protein imbalances in the natural ecosystems. The Biodome provides an effective way to produce organic food inexpensively, with a low energy input, in a small space. Fish contain important vitamins and minerals including healthy omega-3 fatty acids and because Biodome fish are low on the food chain there is no concern with accumulated toxins generally associated with some fish species such as tuna. Robs parents left yesterday after spending three days with us here at the Folkecenter. They were so impressed with the Biodome that they were already discussing with us options to build one back home. We believe that the trick to building a biodome that can operate year around in Canada will be to incorporate thermal insulating panels that can be installed on the northern hemisphere of the dome during the winter months. We will certainly plan to further investigate our options and maybe even visit some dome manufacturers in the US next year when we are traveling. We will keep you all posted. Hi, do you have any pictures or videos of the inside of your biodome? I am trying to create one of my own using aquaponics similar to what you have and would love to see what it looks like! can anyone tell me where I can visit these domes, and get further educated about them? That dome is in Denmark. http://www.dalyharvest.com/ in black Diamond builds them here in Alberta.